Oaxaca, in Mexico is not off the beaten path like my usual haunts and it is touristy in a low key sort of way. But it had been recommended to me by some and they were right. There is something here that appeals to me. Like most Latin American towns, it is laid out in a rectangular grid. The opulent architecture of the churches lend themselves well to the large squares and plazas dotted with stone fountains. Elaborate cupolas provide beautiful cutouts against the blue skies marred only with wispy clouds. The houses lining the streets have flat-fronted facades broken by doorways, windows and balconies. There are wrought iron grilles across most windows and the tiny balconies, barely six inches deep, have elaborate railings wrought in fancy curlicues. The raised perimeter of the doors and windows are frequently sculpted with figures and scrolls, some elaborate and some more simple. What gives it a special feel is not just the architecture, but the colours. Painted in colours that echo the Caribbean, each house is a feast for the eyes. Bright cobalt blue of the façade contrasts with a vivid orange of the perimeter of the windows and doors. And the sunflower yellow of the walls form a brilliant backdrop for the indigo blue trim. Or the avocado green façade with a vermilion trim. My eyes sigh with pleasure as I look these buildings and I smile. Not all the buildings are so richly adorned or cared for. There are older buildings that are dilapidated and broken but even in their scattered bones and lean ribs I can see the same attention to beauty. 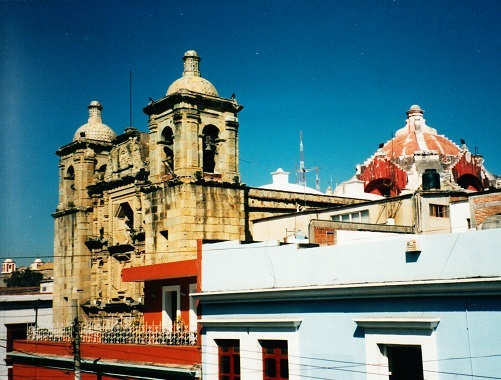 The town is centered around the Zocalo – around the church and the plaza. During the day, under blue skies marred only by a few wispy clouds, the square awakens to street vendors selling beads and bangles and paintings and pottery. Vendors set up shop in every nook and cranny – around the square, under the large shade trees, around the open-sided gazebo. Their stalls exhibit the typical arts and crafts of Mexico, a lot of which originates in this area. Pigeons strut around, liberally spattering the flagstones with their droppings. An old woman sits on a park bench offering crumbs. Against a closed doorway is the hunched-up figure of a drunk, looking more like a pile of rags than a person. 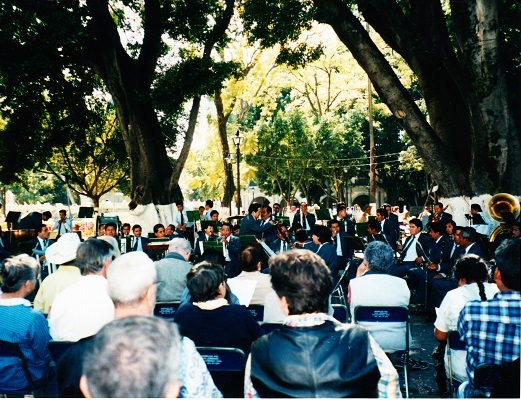 On Sundays an orchestra sets up in the plaza and all are invited to sit awhile and enjoy the music. The Benito Juarez Mercado, a couple of blocks from the Zocalo is a hive of activity. Embroidered cloths hang from the ceiling on one shop. Next door to it are shoes, the leather still carrying the overpowering pungent smell of the tannery. And just around the corner are the fruit stalls with their beguiling array of apples, pears, catii and avocadoes. Ruby red papayas are piled in a pyramid next to yellow pineapples and pink grapefruit. There are piles of mouth-watering mangoes. Among the ripe fruit are green mangoes sliced into slivers and offered with a dash of salt and pepper. 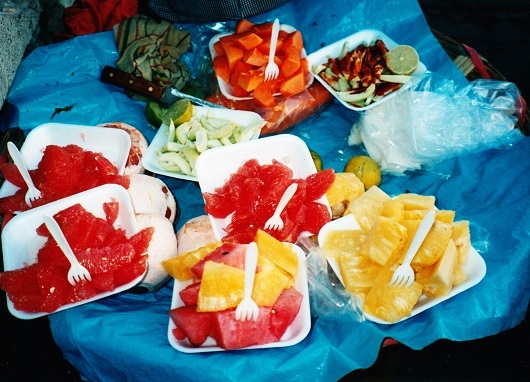 The intoxicating smell of fresh fruit that has just been picked teases my nose and makes my stomach growl with wanting. Down the street a little further on is the creamery where round balls of delicious queso sit next to black mounds of mole. Mole is the traditional black chocolate sauce that originated in Mexico in pre-hispanic times. During the Inca days, cacao beans in these areas were considered precious enough to be used for currency and only the nobles were allowed this heavenly taste. But now, mere mortals such as I can glut ourselves to our hearts content. There is a store here, the Mayordomo that makes chocolate in big vats. It is churned in big steel cylinders and poured into tubs. One can buy fifteen or twenty different kinds. This does not have the creamy taste of Swiss or Belgian chocolates but has a more robust earthy flavor. The crunchiness of sugar crystals amid the bitterness of dark chocolate makes my taste buds dance. As I wander down to the end and turn the corner, I come to the food stalls. There are street vendors with their carts lined up along the sides of the streets. Tacos seem to be the most common. They are quite different from their counterparts across the border though. 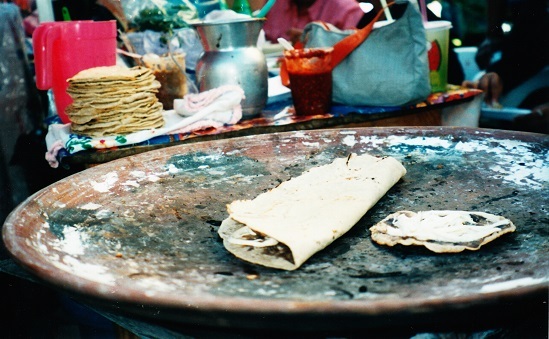 Here they are little round tortillas, filled with chorizo or beef or chicken or pork. And piled with onions and guacamole and salsa. 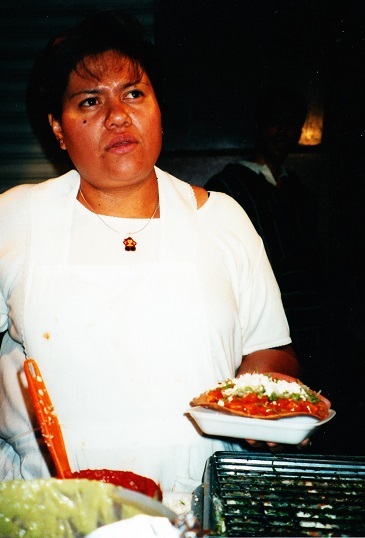 There are empanadas as well – a larger tortilla filled with some sort of meat and deep fried. But these are not the closed empanadas I saw in Bolivia but are open at the ends. And just about everywhere there are hot dog and hamburger stalls. They seem to be inordinately popular among the locals. The smell of grilled meat and sautéed onions floats in the air. A pair of street dogs bicker over the greasy wrappers near the garbage pile. The jostle of people carries me in their wake. The town wears a festive air and most are on holiday. There are parades of men women and children dressed in costumes winding down the street preceded by loud brass bands. Sometimes they stop and dance for a few minutes, encouraging the bystanders to join in. There are Mexican families from elsewhere with children in tow among the scattering of tourists. Balloons bob up and down and the bells and whistles of toys puncture the air. Childish shrieks punctuate the hum of conversation only to be drowned out by the musicians. 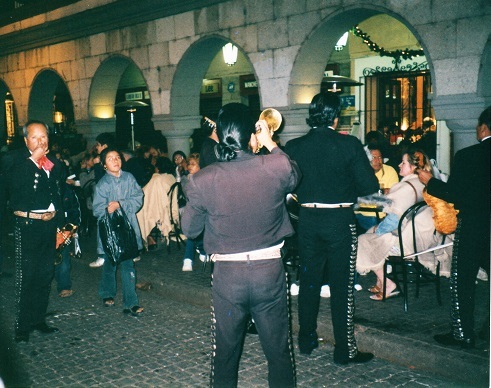 At night a mariachi band, its members dressed in black uniforms with gold sequins, lift trombones and trumpets and a soulful songs drift over the diners seated at the outdoor cafes and sidewalk tables. Across the plaza are three men with Peruvian flutes and a calabash. Around the corner are three street kids with a mouthorgan and a hollow wooden box that one of them taps like a drum. They make foot-tapping music out of them. Conversations in a multitude of languages drifts in the breeze and in the distance is the sound of some fireworks going off. The evening is mellow and it will be a while until the last reveler is persuaded to call it a night.